Spontaneous order, a concept first formalized as the term “extended order” (also called emergent order) in The Fatal Conceit by Friedrich Hayek, resonates as one of the core features underlying the Austrian perspective of economics. Essentially, it boils down to the idea that the order we see in the world is “the result of human action, but not the execution of any human design.” Common examples are found in informal foot traffic or in the prevalence/varieties of bread in supermarkets, despite a lack of any centralized control. Such phenomena also occur within the world of online video games. Interestingly, such phenomena also occur within the world of online video games (though not surprisingly given the inherently social aspect and the approximately 700 million people that play online games as of 2013). Given its reliance and emphasis on social mechanics, moreover, the 2014 breakout hit Destiny serves as a great case study of spontaneous order within this realm. Certainly, on some level, a “designed game” exists. However, its completion is relatively uninteresting in terms of observing spontaneous order. However, the real game, as most players know, does not begin until you “beat” the game. This oxymoron lies in the open-ended wealth of opportunities available to you in end-game content, for example, raids, Nightfalls, tournaments, unique loadouts, extended customization, etc. This, in addition to the engagement that takes place on external platforms, constitutes the main area in which we can observe emerging order. Furthermore, since its initial debut, several expansions and a full-length sequel have been released, all of which contribute to the complexity and variety of this content, as well as to the problems associated with it. Four elements within Destiny’s universe exhibit such order: the matchmaking system, the character customization/loot system; the Crucible (competitive multiplayer); and the story (cooperative multiplayer). The first three represent what I call the positive instances of such orders, while the story constitutes a more negative example (though some positive gains exist here as well). In addition, these areas remain distinct and intricately connected at the same time, and as such, the former two might be thought of as a “functional” level of order which feeds into the “applied” level of order seen in the latter two. Players could create teams more responsive to their needs than an automated system. Granted, not all order present in the game should be thought of as emergent. However, the fact that the game exhibits these types of order at all highlights the general relevance of video games for exploring economic questions and in discussing this unique Austrian contribution to our understanding of the world. Regarding matchmaking, order emerges primarily through the game’s use of mesh- networking. This enables all parts of the game world to be populated all the time. While this ensures direct player interaction, Bungie left the actual formation of teams largely in the hands of players. With the exception of some rudimentary matchmaking services which have expanded in Destiny 2 with Guided Games, players must create their own fireteams in order to participate in a number of activities. 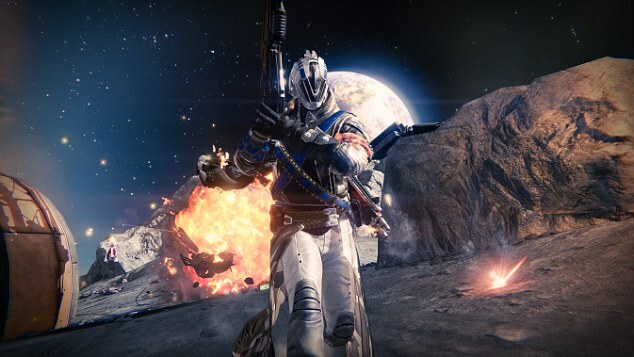 While on its surface, this may seem like an insurmountable task which would lead to inactivity and apathy, players collectively worked around this problem through independent sites such as Destiny LFG. Though this practice resulted in some controversy, in the end, it meant that players could create teams more responsive to their needs than an automated system. As we shall see regarding issues with the game’s underlying story, other problems within the base game are resolved in a similar fashion. Moving on, the sheer number of options available in terms of equipment, items, and abilities allow for some pretty creative solutions to a wide number of in-game problems. This creates an environment that fosters experimentation. As documented by Planet Destiny, over 5,000 weapon/armor pieces and items exist for players to collect (in addition to a wide range of abilities), and these collectibles represent a robust opportunity for players to mix and match equipment to approach a variety of different challenges. The process for collecting these pieces is summed up well in the metaphor of a slot machine by Danny O’Dwyer. Notably, he does express some moral qualms about this system, but nevertheless, his analysis reveals the potential for customization in this game. This is important because players, instead of being directed (outside of a very limited sense) towards the ideal combinations, remain free to explore the best matchups for each scenario and customize to their individual playstyles. This creates an environment that fosters experimentation, which ultimately leads to some widely accepted norms. For example, most players know that you should use the weapon Gjallarhorn to quickly take down bosses such as Crota or that Titan bubbles create an efficient means of generating light energy. Building off this, the Crucible usefully highlights the positive diversity of this phenomenon. In this competitive mode, some players prefer the versatility of a scout rifle, while others rely on the high impact of a hand cannon or the high fire-rate of an auto-rifle. In addition, each particular weapon possesses unique perks that provide certain advantages such as permanent radar, extra grenades, faster supers, etc. Despite this, again through experimentation, players collectively discover the most effective loadouts for different situations, without any sort of direction. As such, certain strategies form which capitalize on each player’s Distinct Comparative Advantages. Strategies form which capitalize on each player’s distinct comparative advantages. In contrast, the more negative side resides within the story. Since the creators of Destiny failed to flesh out the initial story in the game, and instead locked much of it behind external Grimoire cards, many players express difficulty in comprehending or enjoying the backstory and overarching plot. Furthermore, to even access these Grimoire cards, players must achieve certain unclear objectives in-game, so the story quickly becomes disjointed. To remedy this, individuals work collectively document it on third-party websites such as TRN, but this still constitutes a worse solution than just including it in game. However, from a more positive perspective, this flaw also incentivizes the player community to contribute and create a greater narrative about the Destiny universe as seen on various forum postings, media articles, and YouTube videos. In the end, the value of this order must lie in the eye of the beholder. Video games present some interesting and robust examples of the spontaneous order phenomenon. Destiny, given its unique place in the repertoire, constitutes a particularly interesting case study. From its use of in-depth customization and responsive informal matchmaking systems to player-driven norms and creativity, it highlights the value of allowing gamers the freedom to innovate.